I have an usual name, Zoe Feast. That’s Zoe with a long “eeee” sound at the end and Feast pronounced Feast… as in Thanksgiving Feast. It really is that easy! 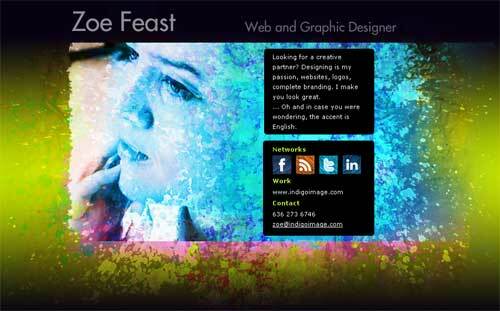 As a self marketing project I have made use of my name and launched ZoeFeast.com today. It follows the lines of a ” business card website”, inspired by this great blog post. A simple, one page portal to my networks and company. I broke away from my Indigo Image corporate brand image for this project and enjoyed the creative freedom. What unique aspect do you have with which to market your business? This entry was posted in Random Thoughts, St Louis Web Designer, Web Design Projects. Bookmark the permalink. ← St Louis Web Designer’s question of the day: Do you provide web hosting?